ITS no more news that Netflix is now in Nigeria, am sure most of you are aware and for all those who aren't, now you are. But when you think of online tv streaming, the next thin that comes to your mind is data `considering how expensive it really is to subscribe here in NIGERIA. Etisalat is really quick to introduce a package for Netflix users. Although this is not a new package. 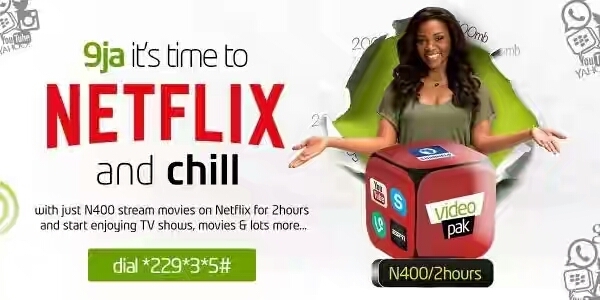 its actually their normal movie streaming package integrated to work with Netflix and it cost N4000 for 2hours. To subscribe for this package, just dial*229*3*5#. personally i think this a bit expensive considering the fact that you still have to subscribe separately for Netflix every month. But lets just wait for other network providers to introduce their own packages, probably with the competitions, there will be more better options.